In the past year, both the United Kingdom’s national referendum to withdraw from the EU and Donald Trump’s victory in the US presidential election have surprised people all over the world. These events also defied the predictions of many in the media and the news. Many experts in both Japan and worldwide fear these events are a harbinger of isolationism, anti-foreignism, and populism. Such experts firmly believe that globalization is the way of progress, and indeed the destiny of mankind. They also believe that globalization will bring about a free, peaceful, and stable global society which is blessed economically. Globalization can be summed up as lowering country borders to increase the flow of people, products, money, and services. In modern society, globalization is believed to be without a doubt a good thing, and economics and other systems are planned on being universalized to advance globalization. Take economics for instance. The US style capitalist system – where stockholders are highly influential – is being introduced into Japan and other countries. When it comes to culture, countries like Japan are leaning towards using English (the “lingua franca”) in business and education. However, is globalization all it’s cracked up to be? Looking at recent worldwide events, the assumption that globalization is progress and creates a free and stable society doesn’t seem to hold true. Consider the frequent terror attacks stemming from immigrant problems in the past few months: London Bridge (June 3rd), Manchester (May 22nd), the attack on Paris’ Avenue des Champs-Elysees (April 20th), and the Dortmund bus terror attack in Germany (April 17). Adding insult to injury, the economic disparity in developed countries has ballooned since globalization became mainstream in the 1980’s. French economist Thomas Piketty points out that the US’s economic disparity is larger than it was during the Great Depression, and the worst on record. According to British economist Ha-Joon Chang, the economic growth of developing countries has actually declined with globalization. French anthropologist and economist Emmanuel Todd frequently uses the term “globalization fatigue” in his interviews and writings. According to Todd, people in developed nations are fed up with and exhausted by the widening economic disparity, sudden increase in immigrants, breakdown of democracy, and opportunism of the global elite – all products of the globalization trend initiated in the 1980’s. Todd points out that “globalization fatigue” is what lies behind the UK’s departure from the EU and Trump’s victory. What can be done to steer globalization in the right direction so that many can live in a stable and abundant society? The key is translation. Translation contains hints for creating a world that will be far better off than that steered by globalization. In the next two articles, let’s look at the hints translation provides. In this article, we’ll consider the history of modernization in Western Europe. 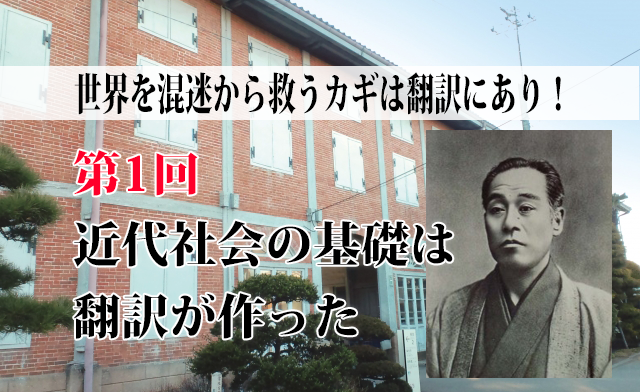 In the next article, we’ll cover Japan’s experience during the Meiji Restoration period. These periods clearly emphasize that our views on globalization are mistaken. 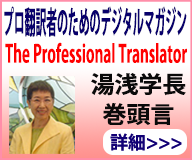 Finally, I’ll discuss the importance of translation in creating a better world. Globalization is bringing about various problems, such as terrorism and widening disparity. Why is it then that cries for pushing forward globalization continue persistently? One major reason is that many people have the preconception that globalization equals social progress, and is an inevitable outcome in history. This framework assumes that indigenous local societies shift towards a universal society. In other words, we progress from indigenous to universal. We are currently in the transitional period from country to corporate body. It’s believed therefore that the rules, systems, and languages of various regions will integrate into a common or universal form. This view explains why many people believe globalization is equated with progress, and therefore support globalization. Even those who aren’t supporters believe the world is moving in that direction and therefore nothing can be done. This assumption however is at best one-sided. Take for example what could be considered the biggest act of “progress” in world history – modernization in the West. This was not simply a shift from indigenous to universal. Recall what you learned in world history class. You were taught that the Reformation marked the beginning of Western modernization. The Reformation was characterized by the translation of the Bible. I learned the same thing in high school, but at the time didn’t understand why Bible translation was that important. It was however that important. Latin was considered the universal language (language used worldwide) in Europe in the Middle Ages. Latin was the common language of nobles, clergy, scholars, and others in the privileged elite class. The Bible was written in Latin. Church ceremonies were conducted in Latin. In universities, philosophy and other academics were written and discoursed in Latin. However, most common people didn’t understand Latin. Only the few elite could freely use Latin. Everyone else had no opportunities to learn Latin, and instead used their indigenous language in everyday life. Indigenous languages were those languages people used in their region to communicate daily. Indigenous languages didn’t contain the rich vocabulary needed to express abstract and intellectual concepts, and didn’t have set orthographic rules (rules for correct writing). It is believed that these languages were not suitable for elaborate, intellectual debates and discourse. People didn’t understand Latin, so they were unable to read the Bible, which was supposed to be the foundation of their faith. When it came to academics, they couldn’t be exposed to philosophy, natural sciences, law, and history, and were unable to deeply pursue intellectual thought and discourse. Most people were almost completely unable to develop or display their intellectual abilities. These were the conditions in which those like Martin Luther and William Tyndale translated the Bible into common languages. Luther and Tyndale translated the Bible into languages that are the basis for modern-day German and English. The same happened when it came to philosophy. Philosophy in the West during the Middle Ages was predominantly written in Latin. However, as the West shifted to modern times, philosophy came to be written and discoursed in languages used in everyday life. Descartes’ treatise Discourse on the Method, well-known for the saying, “I think, therefore I am”, marked the beginning of modern philosophy. This was arguably the first book of philosophy to be written in French. After Descartes, modern philosophers no longer wrote in Latin but rather in regional languages used everyday life. Hobbes wrote in English, Voltaire in French, and Kant in German. Academics apart from philosophy were also discoursed in various regional languages. Translation of the Bible and pursuit of academics in various languages had great significance. Religion and academics in the West prior to modernization was controlled by the privileged elite class which understood Latin, but with modernization religion and academics were conducted in everyday languages. This means that people could learn with greater ease. The academic world expanded immensely. The Bible and other academic literature was written in everyday languages, so with a little effort people could tap into the diverse knowledge offered at that time. In terms of languages, Latin, Greek, and Hebrew vocabulary were translated and integrated into, and therefore enriched, various languages. In modern times, law also began to be written in various languages, and social systems operated as well in those diverse languages. The power of translation was great in establishing modern society. Through translation, people throughout the world could tap into and learn ancient and modern diverse knowledge from abroad, hone their abilities, and have a social environment where they could display those abilities. During the Middle Ages, only the few elite well-versed in Latin could access specialized knowledge, while most people were unable to develop their intellectual skills, and had difficulty therefore participating in society. Through translation however, in modern times many people have become able to develop their abilities and participate in their country’s society in their language. This majority of people, that had up to that time been excluded from society, brought a new vitality as they started participating in society and their strength was channeled. In a sense, it is this concentration of the people’s strength that was the catalyst for modernization, and translation was the key to opening the door to those societies. Considered in this way, it becomes evident that the current historical viewpoint based on globalization doesn’t make sense. The viewpoint that moving from indigenous to universal is progress – which promoters of globalization assume – is extremely one-sided to say the least. The establishment of modern society in the West was brought about by translating cutting-edge knowledge written in the “universal language” of Latin into the languages of various regions. In other words, it was a process of translation and indigenization. That is why it is more appropriate to view the process of modernization not as one of indigenization to universal, but rather as moving from universal to (various) indigenous areas. Through translation and indigenization, many people in various countries could access knowledge expressed in a way familiar to them, which allowed them to develop and exert their abilities in an environment that allowed them to do so. This made the establishment of lively modern societies possible. Considered in this light, the current belief that globalization will bring about global happiness is extremely doubtful. The root of globalization today, as I mentioned, is a vast disparity increase in many countries. This results in a declining number of people privileged enough to participate in society and both develop and exert their abilities. Globalization is likely to lead to backsliding rather than progress. In my next article, we’ll look at Japan’s modernization during the Meiji Restoration period in considering how to attain a better world and the important role translation plays. 1Born in 1971. Associate Professor of Social and Cultural Studies at Kyushu University (political science). 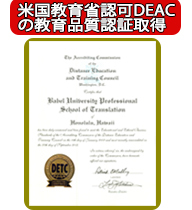 Studied at Sheffield University’s Graduate School in the UK, and at Keio University graduate school. Holds a Ph.D. in Law. Author of Eigoka wa Guminka (Englishnization Leads to Dumbification) (Shueisha Shimbun, 2015).